HR professional with progressive hands on international experience in employee recruitment and retention, leadership and employee development, conflict resolution, HR records management, HR policies and procedures and legal compliance. Organized and resourceful team player who is effective at building relationships with both management and employees at all levels within an organization in order to support the business strategy and optimize organizational performance. Highly motivated to learn and progress within the field of Human Resources and accomplish MBA in HRM. 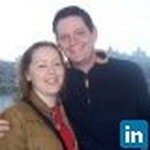 I am a Career Recruiter who is passionate about social media and technology. My job allows me to enjoy both recruiting and social media as work for a company in Cork, Select People- a recruiting company specialising in senior executive positions in off-shore jurisdictions and also with the Dublin firm, Social Talent. Social Talent is a talent acquisition consultancy and agency that specialises in building talent communities, training internet recruiters & sourcing recruitment staff for clients globally. Our expertise is in the use of social media, the internet and technology to recruit talent; elements that are core to our unique range of services. We enable recruiters to gain a distinct competitive advantage in hiring and retaining talented individuals by leveraging the most innovative technologies, methodologies and sourcing techniques available without the need to devote internal resources, time and capital. We provide recruiters with a direct source of passive candidate profiles and contact information and we build niche, targeted communities from which they can source for their needs. Acting as the key contact for management within a call centre environment on all employee relations and HR matters. Assisting in the development and implementation of HR policies and procedures (disciplinary, attendance, vacation, etc). Advising management and employees on the interpretation of HR policies, compensation and benefit programs, etc. Leading full cycle recruitment including: developing appropriate recruitment strategies to meet staffing requirements, posting positions internally and externally, resume screening and interviewing, reference checking and issuing employment offers. Facilitating employee orientation and on-boarding process of all new hires. Researching and reporting key HR metrics (attrition, retention, exit data, etc). Assessing and developing the learning and development needs of management and staff. Administering employee benefit programs (e.g. group life insurance, healthcare and dental benefits, etc). Ensuring compliance with provincial laws and regulations relating to employment standards, employment equity, human rights, etc. Supporting the Joint Health and Safety Committee by coordinating and chairing monthly meetings, submitting monthly minutes to WorkSafeNB, etc. Maintaining and updating personnel files. Coordinated planning activities regarding hiring needs and recruiting strategies. Screened resumes, scheduled and conducted interviews with job candidates. Checked references and issued contracts to potential new hires. Facilitated induction training to new hires. Developed and implemented annual Training Plan. Designed and delivered internal training solutions. Advised management and employees on HR policies and procedures. Prepared monthly and quarterly HR reports (e.g., recruitment, employee relations initiatives, performance management, accident and disciplinary figures, etc). Monitored and managed employee turnover and absenteeism. Organized and conducted disciplinary meetings and investigated employee grievances in accordance with company policies and employment legislation. Coordinated annual employee satisfaction survey and all related follow-up activities. Facilitated monthly employee relations committee meetings. Conducted exit interviews with all leavers. Ensured career development and performance management plans were established and adhered to for management and specialist employees. Coordinated all tasks related to the performance management and management assessment processes. Join Today to follow and contact David Shannon.